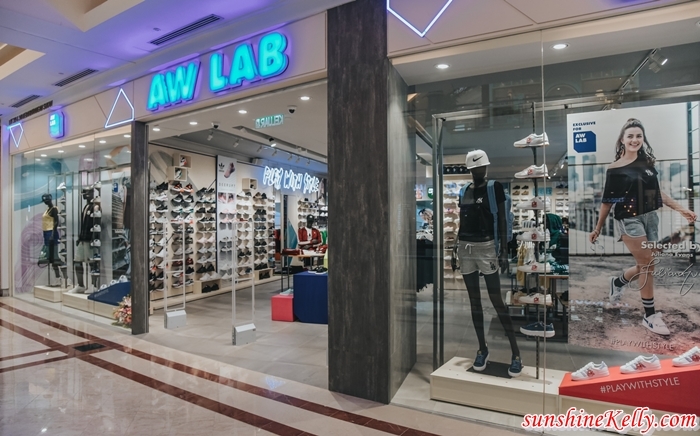 Recently, AW LAB the multi-brand sneakers-apparel store leader launches its first flagship store at the 3rd at lot 339 & 340 in Suria KLCC. AW LAB brings a wide selection of the latest and coolest sneakers and apparel from the best brands to Malaysian shores. The first store in Malaysia features a contemporary and bright concept that invites you to indulge in AW LAB’s payoff PLAY WITH STYLE. The store is part of the brand’s expansion across Southeast Asia, following a successful launch in Singapore. The modern store design is whited out from floor to ceiling to create an ultra-sleek & bright space akin to a laboratory of trends conceiving the ‘urban sport-style’. Bright hued, block colors of dynamic stark lighting in the product display is meant to bring out the playful and modern concept. AW LAB is not only the latest sports style retailer, it is also the pioneer in the street style trend. Caprice, Juliana Evans, Alicia Amin & Elizabeth Tan are the 4 celebrity friends who truly embody these values. They’re out of the box, break convention and are not afraid to bring out the bold. As a global futuristic brand, the launch featured the latest AW LAB exclusive collection from Adidas, Puma, Reebok and many others took the limelight. The multi-brand sneaker-apparel label houses the latest sneaker models, clothing and accessories from leading sportswear brands such as Nike, Jordan, Asics, Onitsuka Tiger Converse, New Balance, Vans, Superga, Diadora, Kappa, Jason Markk, Herschel as well as AW LAB’s own clothing brands - Down UP & Two of a Kind. Along with the launch, AW LAB brought its own private label – Down UP & Two of a Kind. These private labels embody the PLAY WITH STYLE movement with strong personalities, and an alternative to quality clothing. Grabbing people’s attention and combining the latest fashion trends, these 2 new entry brands in Malaysia’s street wear scene caters to both men and women.